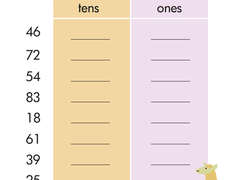 Help your kid better understand place value with our worksheets. 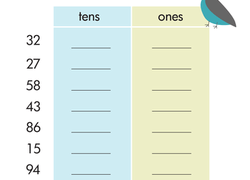 We have basic printables that remain on the right-hand side of the decimal, focusing on ones, tens, and hundreds. 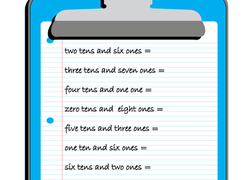 Our collection also contains more challenging worksheets that carry over to the left side and have your kid practise identifying tenths, hundredths, even thousandths. We know that place value can be tricky, but our worksheets go the extra mile to help kids figure out what's going on with the numbers on both sides of the decimal. 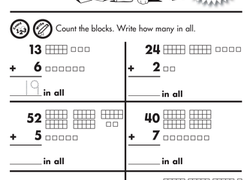 Browse our place value worksheets and find a few for your budding mathematician. Write down several numbers on paper. Ask your child if he can find any numbers that have a tens place. Can he find the number '6' in the ones place in any numbers? A number 4 in the hundreds place? Once your child seems comfortable with the first set of numbers, try adding numbers with the thousands place. Help your child see the breakdown of numbers with an example. Write down the number 342. Explain, "The number 342 is made up of three place values. The '3' is in the hundreds place, the '4' is in the tens place, and the '2' is in the ones place. We can break the number 342 into three seperate numbers from these place values." Draw arrows connecting each place value in 342 to '300,' '40,' and '2.' Explain how you did this.